Proprietary Name: Cancidas What is the Proprietary Name? Non-Proprietary Name: Caspofungin Acetate What is the Non-Proprietary Name? Cancidas with NDC 0006-3823 is a a human prescription drug product labeled by Merck Sharp & Dohme Corp.. The generic name of Cancidas is caspofungin acetate. The product's dosage form is injection, powder, lyophilized, for solution and is administered via intravenous form. FDA Application Number: NDA021227 What is the FDA Application Number? Start Marketing Date: 01-26-2001 What is the Start Marketing Date? Why is caspofungin injection medication prescribed? CANCIDAS® is indicated as empirical therapy for presumed fungal infections in febrile, neutropenic adult and pediatric patients (3 months of age and older) [see Clinical Studies (14.1, 14.5)]. CANCIDAS is indicated for the treatment of candidemia and the following candida infections: intra-abdominal abscesses, peritonitis, and pleural space infections in adult and pediatric patients (3 months of age and older) [see Clinical Studies (14.2, 14.5)]. Limitations of Use: CANCIDAS has not been studied in endocarditis, osteomyelitis, and meningitis due to Candida. Limitations of Use: CANCIDAS has not been approved for the treatment of oropharyngeal candidiasis (OPC). In the study that evaluated the efficacy of caspofungin in the treatment of esophageal candidiasis, patients with concomitant OPC had higher relapse rate of the OPC [see Clinical Studies (14.3)]. Limitations of Use: CANCIDAS has not been studied as initial therapy for invasive aspergillosis. Empirical Therapy for Presumed Fungal Infections in Febrile Neutropenic PatientsAdminister a single 70-mg loading dose on Day 1, followed by 50 mg once daily thereafter. Duration of treatment should be based on the patient's clinical response. Continue empirical therapy until resolution of neutropenia. In general, treat patients found to have a fungal infection for a minimum of 14 days after the last positive culture and continue treatment for at least 7 days after both neutropenia and clinical symptoms are resolved. If the 50-mg dose is well tolerated but does not provide an adequate clinical response, the daily dose can be increased to 70 mg.
Candidemia and Other Candida InfectionsAdminister a single 70-mg loading dose on Day 1, followed by 50 mg once daily thereafter. Duration of treatment should be dictated by the patient's clinical and microbiological response. In general, continue antifungal therapy for at least 14 days after the last positive culture. Patients with neutropenia who remain persistently neutropenic may warrant a longer course of therapy pending resolution of the neutropenia. Esophageal CandidiasisThe dose is 50 mg once daily for 7 to 14 days after symptom resolution. A 70-mg loading dose has not been studied for this indication. Because of the risk of relapse of oropharyngeal candidiasis in patients with HIV infections, suppressive oral therapy could be considered [see Clinical Studies (14.3)]. Invasive AspergillosisAdminister a single 70-mg loading dose on Day 1, followed by 50 mg once daily thereafter. Duration of treatment should be based upon the severity of the patient's underlying disease, recovery from immunosuppression, and clinical response. Adult Patients:Adult patients on rifampin should receive 70 mg of CANCIDAS once daily. When CANCIDAS is co-administered to adult patients with other inducers of hepatic CYP enzymes such as nevirapine, efavirenz, carbamazepine, dexamethasone, or phenytoin, administration of a daily dose of 70 mg of CANCIDAS should be considered [see Drug Interactions (7)]. Pediatric Patients:Pediatric patients on rifampin should receive 70 mg/m2 of CANCIDAS daily (not to exceed an actual daily dose of 70 mg). When CANCIDAS is co-administered to pediatric patients with other inducers of hepatic CYP enzymes, such as efavirenz, nevirapine, phenytoin, dexamethasone, or carbamazepine, a CANCIDAS dose of 70 mg/m2 once daily (not to exceed 70 mg) should be considered [see Drug Interactions (7)]. Reconstitution of CANCIDAS for Intravenous InfusionEquilibrate the refrigerated vial of CANCIDAS to room temperature. Aseptically add 10.8 mL of 0.9% Sodium Chloride Injection, Sterile Water for Injection, Bacteriostatic Water for Injection with methylparaben and propylparaben, or Bacteriostatic Water for Injection with 0.9% benzyl alcohol to the vial. Each vial of CANCIDAS contains an intentional overfill of CANCIDAS. Thus, the volume of diluent to be added to each vial and the drug concentration of the resulting solution is listed in Table 1 below.Table 1: Information for Preparation of CANCIDASCANCIDAS vial (equivalent to caspofungin)Volume of diluent to be addedReconstitution volume of diluent to be added is based on the overfill amount of caspofungin (54.6 mg and 75.6 mg, respectively).Resulting Concentration following Reconstitution50 mg10.8 mL5 mg/mL70 mg10.8 mL7 mg/mLThe white to off-white cake will dissolve completely. Mix gently until a clear solution is obtained. Visually inspect the reconstituted solution for particulate matter or discoloration during reconstitution and prior to infusion. Do not use if the solution is cloudy or has precipitated.The reconstituted solution of CANCIDAS in the vial may be stored for up to one hour at ≤25°C (≤77°F) prior to the preparation of the infusion solution in the intravenous bag or bottle.CANCIDAS vials are for single-dose only. Discard unused portion. Dilution of the Reconstituted Solution in the Intravenous Bag for InfusionAseptically transfer the appropriate volume (mL) of reconstituted CANCIDAS to an intravenous (IV) bag (or bottle) containing 250 mL of 0.9%, 0.45%, or 0.225% Sodium Chloride Injection or Lactated Ringers Injection. Alternatively, the volume (mL) of reconstituted CANCIDAS can be added to a reduced volume of 0.9%, 0.45%, or 0.225% Sodium Chloride Injection or Lactated Ringers Injection, not to exceed a final concentration of 0.5 mg/mL.This diluted infusion solution in the intravenous bag or bottle must be used within 24 hours if stored at ≤25°C (≤77°F) or within 48 hours if stored refrigerated at 2 to 8°C (36 to 46°F). Important Reconstitution and Dilution Instructions for Pediatric Patients 3 Months of Age and OlderFollow the reconstitution procedures described above using either the 70-mg or 50-mg vial to create the reconstituted solution [see Dosage and Administration (2.3)]. From the reconstituted solution in the vial, remove the volume of drug equal to the calculated loading dose or calculated maintenance dose based on a concentration of 7 mg/mL (if reconstituted from the 70-mg vial) or a concentration of 5 mg/mL (if reconstituted from the 50-mg vial).The choice of vial should be based on total milligram dose of drug to be administered to the pediatric patient. To help ensure accurate dosing, it is recommended for pediatric doses less than 50 mg that 50-mg vials (with a concentration of 5 mg/mL) be used if available. The 70-mg vial should be reserved for pediatric patients requiring doses greater than 50 mg.The maximum loading dose and the daily maintenance dose should not exceed 70 mg, regardless of the patient's calculated dose. Clinical Trials Experience in AdultsThe overall safety of CANCIDAS was assessed in 1865 adult individuals who received single or multiple doses of CANCIDAS: 564 febrile, neutropenic patients (empirical therapy study); 382 patients with candidemia and/or intra-abdominal abscesses, peritonitis, or pleural space infections (including 4 patients with chronic disseminated candidiasis); 297 patients with esophageal and/or oropharyngeal candidiasis; 228 patients with invasive aspergillosis; and 394 individuals in phase I studies. In the empirical therapy study patients had undergone hematopoietic stem-cell transplantation or chemotherapy. In the studies involving patients with documented Candida infections, the majority of the patients had serious underlying medical conditions (e.g., hematologic or other malignancy, recent major surgery, HIV) requiring multiple concomitant medications. Patients in the noncomparative Aspergillus studies often had serious predisposing medical conditions (e.g., bone marrow or peripheral stem cell transplants, hematologic malignancy, solid tumors or organ transplants) requiring multiple concomitant medications. Empirical Therapy for Presumed Fungal Infections in Febrile Neutropenic PatientsIn the randomized, double-blinded empirical therapy study, patients received either CANCIDAS 50 mg/day (following a 70-mg loading dose) or AmBisome® (amphotericin B liposome for injection, 3 mg/kg/day). In this study clinical or laboratory hepatic adverse reactions were reported in 39% and 45% of patients in the CANCIDAS and AmBisome groups, respectively. Also reported was an isolated, serious adverse reaction of hyperbilirubinemia. Adverse reactions occurring in 7.5% or greater of the patients in either treatment group are presented in Table 2.Table 2: Adverse Reactions Among Patients with Persistent Fever and Neutropenia Incidence 7.5% or greater for at Least One Treatment GroupAdverse ReactionsCANCIDAS70 mg on Day 1, then 50 mg once daily for the remainder of treatment; daily dose was increased to 70 mg for 73 patients.N=564 (percent)AmBisome3 mg/kg/day; daily dose was increased to 5 mg/kg for 74 patients.N=547 (percent)Within any system organ class, individuals may experience more than 1 adverse reaction.All Systems, Any Adverse Reaction 9597Investigations 5863 Alanine Aminotransferase Increased1820 Blood Alkaline Phosphatase Increased1523 Blood Potassium Decreased1523 Aspartate Aminotransferase Increased1417 Blood Bilirubin Increased1014 Blood Magnesium Decreased79 Blood Glucose Increased69 Bilirubin Conjugated Increased59 Blood Urea Increased48 Blood Creatinine Increased311General Disorders and Administration Site Conditions5763 Pyrexia2729 Chills2331 Edema Peripheral1112 Mucosal Inflammation68Gastrointestinal Disorders5055 Diarrhea2016 Nausea1120 Abdominal Pain911 Vomiting917Respiratory, Thoracic and Mediastinal Disorders4749 Dyspnea910Skin and Subcutaneous Tissue Disorders 42 37 Rash1614Nervous System Disorders 25 27 Headache1112 Metabolism and Nutrition Disorders 21 24 Hypokalemia6 8 Vascular Disorders20 23 Hypotension6 10Cardiac Disorders 16 19 Tachycardia7 9 The proportion of patients who experienced an infusion-related adverse reaction (defined as a systemic event, such as pyrexia, chills, flushing, hypotension, hypertension, tachycardia, dyspnea, tachypnea, rash, or anaphylaxis, that developed during the study therapy infusion and one hour following infusion) was significantly lower in the group treated with CANCIDAS (35%) than in the group treated with AmBisome (52%).To evaluate the effect of CANCIDAS and AmBisome on renal function, nephrotoxicity was defined as doubling of serum creatinine relative to baseline or an increase of greater than or equal to 1 mg/dL in serum creatinine if baseline serum creatinine was above the upper limit of the normal range. Among patients whose baseline creatinine clearance was greater than 30 mL/min, the incidence of nephrotoxicity was significantly lower in the group treated with CANCIDAS (3%) than in the group treated with AmBisome (12%). Invasive AspergillosisIn an open-label, noncomparative aspergillosis study, in which 69 patients received CANCIDAS (70-mg loading dose on Day 1 followed by 50 mg daily), the following adverse reactions were observed with an incidence of 12.5% or greater: blood alkaline phosphatase increased (22%), hypotension (20%), respiratory failure (20%), pyrexia (17%), diarrhea (15%), nausea (15%), headache (15%), rash (13%), alanine aminotransferase increased (13%), aspartate aminotransferase increased (13%), blood bilirubin increased (13%), and blood potassium decreased (13%). Also reported in this patient population were pulmonary edema, ARDS (adult respiratory distress syndrome), and radiographic infiltrates. Cyclosporine: In two adult clinical studies, cyclosporine (one 4 mg/kg dose or two 3 mg/kg doses) increased the AUC of CANCIDAS. CANCIDAS did not increase the plasma levels of cyclosporine. There were transient increases in liver ALT and AST when CANCIDAS and cyclosporine were co-administered. Monitor patients who develop abnormal liver enzymes during concomitant therapy and evaluate the risk/benefit of continuing therapy [see Warnings and Precautions (5.2) and Clinical Pharmacology (12.3)]. Tacrolimus: For patients receiving CANCIDAS and tacrolimus, standard monitoring of tacrolimus trough whole blood concentrations and appropriate tacrolimus dosage adjustments are recommended. Rifampin: Rifampin is a potent CYP3A4 inducer and concomitant administration with CANCIDAS is expected to reduce the plasma concentrations of CANCIDAS. Therefore, adult patients on rifampin should receive 70 mg of CANCIDAS daily and pediatric patients on rifampin should receive 70 mg/m2 of CANCIDAS daily (not to exceed an actual daily dose of 70 mg) [see Dosage and Administration (2.5) and Clinical Pharmacology (12.3)]. Adults: When CANCIDAS is co-administered to adult patients with other inducers of hepatic CYP enzymes, such as efavirenz, nevirapine, phenytoin, dexamethasone, or carbamazepine, administration of a daily dose of 70 mg of CANCIDAS should be considered [see Dosage and Administration (2.5) and Clinical Pharmacology (12.3)]. Pediatric Patients: When CANCIDAS is co-administered to pediatric patients with other inducers of hepatic CYP enzymes, such as efavirenz, nevirapine, phenytoin, dexamethasone, or carbamazepine, administration of a daily dose of 70 mg/m2 CANCIDAS (not to exceed an actual daily dose of 70 mg) should be considered [see Dosage and Administration (2.5) and Clinical Pharmacology (12.3)]. DistributionPlasma concentrations of caspofungin decline in a polyphasic manner following single 1-hour IV infusions. A short α-phase occurs immediately postinfusion, followed by a β-phase (half-life of 9 to 11 hours) that characterizes much of the profile and exhibits clear log-linear behavior from 6 to 48 hours postdose during which the plasma concentration decreases 10-fold. An additional, longer half-life phase, γ-phase, (half-life of 40-50 hours), also occurs. Distribution, rather than excretion or biotransformation, is the dominant mechanism influencing plasma clearance. Caspofungin is extensively bound to albumin (~97%), and distribution into red blood cells is minimal. Mass balance results showed that approximately 92% of the administered radioactivity was distributed to tissues by 36 to 48 hours after a single 70-mg dose of [3H] CANCIDAS. There is little excretion or biotransformation of caspofungin during the first 30 hours after administration. MetabolismCaspofungin is slowly metabolized by hydrolysis and N-acetylation. 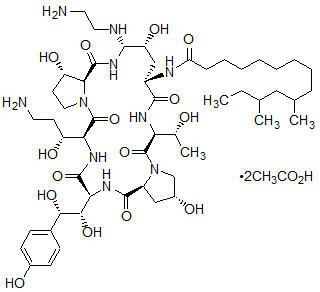 Caspofungin also undergoes spontaneous chemical degradation to an open-ring peptide compound, L-747969. At later time points (≥5 days postdose), there is a low level (≤7 picomoles/mg protein, or ≤1.3% of administered dose) of covalent binding of radiolabel in plasma following single-dose administration of [3H] CANCIDAS, which may be due to two reactive intermediates formed during the chemical degradation of caspofungin to L-747969. Additional metabolism involves hydrolysis into constitutive amino acids and their degradates, including dihydroxyhomotyrosine and N-acetyl-dihydroxyhomotyrosine. These two tyrosine derivatives are found only in urine, suggesting rapid clearance of these derivatives by the kidneys. ExcretionTwo single-dose radiolabeled pharmacokinetic studies were conducted. In one study, plasma, urine, and feces were collected over 27 days, and in the second study plasma was collected over 6 months. Plasma concentrations of radioactivity and of caspofungin were similar during the first 24 to 48 hours postdose; thereafter drug levels fell more rapidly. In plasma, caspofungin concentrations fell below the limit of quantitation after 6 to 8 days postdose, while radiolabel fell below the limit of quantitation at 22.3 weeks postdose. After single intravenous administration of [3H] CANCIDAS, excretion of caspofungin and its metabolites in humans was 35% of dose in feces and 41% of dose in urine. A small amount of caspofungin is excreted unchanged in urine (~1.4% of dose). Renal clearance of parent drug is low (~0.15 mL/min) and total clearance of caspofungin is 12 mL/min. Renal ImpairmentIn a clinical study of single 70-mg doses, caspofungin pharmacokinetics were similar in healthy adult volunteers with mild renal impairment (creatinine clearance 50 to 80 mL/min) and control subjects. Moderate (creatinine clearance 31 to 49 mL/min), severe (creatinine clearance 5 to 30 mL/min), and end-stage (creatinine clearance less than 10 mL/min and dialysis dependent) renal impairment moderately increased caspofungin plasma concentrations after single-dose administration (range: 30 to 49% for AUC). However, in adult patients with invasive aspergillosis, candidemia, or other Candida infections (intra-abdominal abscesses, peritonitis, or pleural space infections) who received multiple daily doses of CANCIDAS 50 mg, there was no significant effect of mild to end-stage renal impairment on caspofungin concentrations. No dosage adjustment is necessary for patients with renal impairment. Caspofungin is not dialyzable, thus supplementary dosing is not required following hemodialysis. Hepatic ImpairmentPlasma concentrations of caspofungin after a single 70-mg dose in adult patients with mild hepatic impairment (Child-Pugh score 5 to 6) were increased by approximately 55% in AUC compared to healthy control subjects. In a 14-day multiple-dose study (70 mg on Day 1 followed by 50 mg daily thereafter), plasma concentrations in adult patients with mild hepatic impairment were increased modestly (19 to 25% in AUC) on Days 7 and 14 relative to healthy control subjects. No dosage adjustment is recommended for patients with mild hepatic impairment.Adult patients with moderate hepatic impairment (Child-Pugh score 7 to 9) who received a single 70-mg dose of CANCIDAS had an average plasma caspofungin increase of 76% in AUC compared to control subjects. A dosage reduction is recommended for adult patients with moderate hepatic impairment based upon these pharmacokinetic data [see Dosage and Administration (2.4)].There is no clinical experience in adult patients with severe hepatic impairment (Child-Pugh score greater than 9) or in pediatric patients with any degree of hepatic impairment. GenderPlasma concentrations of caspofungin in healthy adult men and women were similar following a single 70-mg dose. After 13 daily 50-mg doses, caspofungin plasma concentrations in women were elevated slightly (approximately 22% in area under the curve [AUC]) relative to men. No dosage adjustment is necessary based on gender. RaceRegression analyses of patient pharmacokinetic data indicated that no clinically significant differences in the pharmacokinetics of caspofungin were seen among Caucasians, Blacks, and Hispanics. No dosage adjustment is necessary on the basis of race. Geriatric PatientsPlasma concentrations of caspofungin in healthy older men and women (65 years of age and older) were increased slightly (approximately 28% AUC) compared to young healthy men after a single 70-mg dose of caspofungin. In patients who were treated empirically or who had candidemia or other Candida infections (intra-abdominal abscesses, peritonitis, or pleural space infections), a similar modest effect of age was seen in older patients relative to younger patients. No dosage adjustment is necessary for the elderly [see Use in Specific Populations (8.5)]. Drug Interactions [see Drug Interactions (7)]Studies in vitro show that caspofungin acetate is not an inhibitor of any enzyme in the cytochrome P (CYP) system. Caspofungin is not a substrate for P-glycoprotein and is a poor substrate for CYP enzymes.In clinical studies, caspofungin did not induce the CYP3A4 metabolism of other drugs. Clinical studies in adult healthy volunteers also demonstrated that the pharmacokinetics of caspofungin are not altered by itraconazole, amphotericin B, mycophenolate, nelfinavir, or tacrolimus. Caspofungin has no effect on the pharmacokinetics of itraconazole, amphotericin B, or the active metabolite of mycophenolate. Cyclosporine: In two adult clinical studies, cyclosporine (one 4 mg/kg dose or two 3 mg/kg doses) increased the AUC of caspofungin by approximately 35%. CANCIDAS did not increase the plasma levels of cyclosporine. There were transient increases in liver ALT and AST when CANCIDAS and cyclosporine were co-administered [see Warnings and Precautions (5.2)]. Tacrolimus: CANCIDAS reduced the blood AUC0-12 of tacrolimus (FK-506, Prograf®) by approximately 20%, peak blood concentration (Cmax) by 16%, and 12-hour blood concentration (C12hr) by 26% in healthy adult subjects when tacrolimus (2 doses of 0.1 mg/kg 12 hours apart) was administered on the 10th day of CANCIDAS 70 mg daily, as compared to results from a control period in which tacrolimus was administered alone. For patients receiving both therapies, standard monitoring of tacrolimus whole blood trough concentrations and appropriate tacrolimus dosage adjustments are recommended. Rifampin: A drug-drug interaction study with rifampin in adult healthy volunteers has shown a 30% decrease in caspofungin trough concentrations [see Dosage and Administration (2.5)]. Adults: Results from regression analyses of adult patient pharmacokinetic data suggest that co-administration of other hepatic CYP enzyme inducers (e.g., efavirenz, nevirapine, phenytoin, dexamethasone, or carbamazepine) with CANCIDAS may result in clinically meaningful reductions in caspofungin concentrations. It is not known which drug clearance mechanism involved in caspofungin disposition may be inducible [see Dosage and Administration (2.5)]. Pediatric patients: In pediatric patients, results from regression analyses of pharmacokinetic data suggest that co-administration of dexamethasone with CANCIDAS may result in clinically meaningful reductions in caspofungin trough concentrations. This finding may indicate that pediatric patients will have similar reductions with inducers as seen in adults [see Dosage and Administration (2.5)]. Mechanism of ActionCaspofungin, an echinocandin, inhibits the synthesis of beta (1,3)-D-glucan, an essential component of the cell wall of susceptible Aspergillus species and Candida species. Beta (1,3)-D-glucan is not present in mammalian cells. Caspofungin has shown activity against Candida species and in regions of active cell growth of the hyphae of Aspergillus fumigatus. ResistanceThere have been reports of clinical failures in patients receiving caspofungin therapy due to the development of drug resistant Candida or Aspergillus species. Some of these reports have identified specific mutations in the Fks subunits, encoded by the fks1 and/or fks2 genes, of the glucan synthase enzyme. These mutations are associated with higher MICs and breakthrough infection. Candida species that exhibit reduced susceptibility to caspofungin as a result of an increase in the chitin content of the fungal cell wall have also been identified, although the significance of this phenomenon in vivo is not well known. Interaction With Other AntimicrobialsStudies in vitro and in vivo of caspofungin, in combination with amphotericin B, suggest no antagonism of antifungal activity against either A. fumigatus or C. albicans. The clinical significance of these results is unknown. Susceptibility TestingFor specific information regarding susceptibility test interpretive criteria and associated test methods and quality control standards recognized by FDA for caspofungin, please see: https://www.fda.gov/STIC. How SuppliedCANCIDAS 50 mg is a lyophilized white to off-white cake or powder for intravenous infusion supplied in single-dose vials with a red aluminum band and a plastic cap.NDC 0006-3822-10 supplied as one single-dose vial.CANCIDAS 70 mg is a white to off-white powder/cake for infusion in a vial with a yellow/orange aluminum band and a plastic cap.NDC 0006-3823-10 supplied as one single-dose vial. 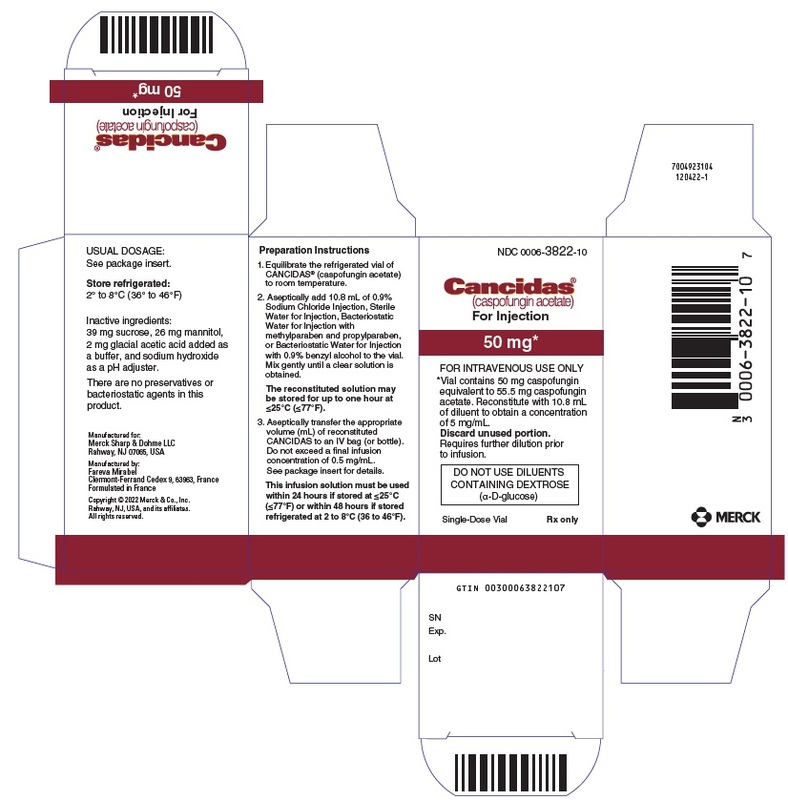 CANCIDAS is indicated for the treatment of esophageal candidiasis in adult and pediatric patients (3 months of age and older) [see Clinical Studies (14.3, 14.5)]. CANCIDAS is indicated for the treatment of invasive aspergillosis in adult and pediatric patients (3 months of age and older) who are refractory to or intolerant of other therapies [see Clinical Studies (14.4, 14.5)]. Administer CANCIDAS by slow intravenous (IV) infusion over approximately 1 hour. Do not administer CANCIDAS by IV bolus administration. For all indications, administer a single 70 mg/m2 loading dose on Day 1, followed by 50 mg/m2 once daily thereafter. The maximum loading dose and the daily maintenance dose should not exceed 70 mg, regardless of the patient's calculated dose. Dosing in pediatric patients (3 months to 17 years of age) should be based on the patient's body surface area (BSA) as calculated by the Mosteller Formula [see References (15)]:Following calculation of the patient's BSA, the loading dose in milligrams should be calculated as BSA (m2) × 70 mg/m2. The maintenance dose in milligrams should be calculated as BSA (m2) × 50 mg/m2.Duration of treatment should be individualized to the indication, as described for each indication in adults [see Dosage and Administration (2.2)]. If the 50-mg/m2 daily dose is well tolerated but does not provide an adequate clinical response, the daily dose can be increased to 70 mg/m2 daily (not to exceed 70 mg). Adult patients with mild hepatic impairment (Child-Pugh score 5 to 6) do not need a dosage adjustment. For adult patients with moderate hepatic impairment (Child-Pugh score 7 to 9), CANCIDAS 35 mg once daily is recommended based upon pharmacokinetic data [see Clinical Pharmacology (12.3)] with a 70-mg loading dose administered on Day 1 where appropriate. There is no clinical experience in adult patients with severe hepatic impairment (Child-Pugh score greater than 9) and in pediatric patients with any degree of hepatic impairment. Do not mix or co-infuse CANCIDAS with other medications, as there are no data available on the compatibility of CANCIDAS with other intravenous substances, additives, or medications.Do not use diluents containing dextrose (α-D-glucose), as CANCIDAS is not stable in diluents containing dextrose. CANCIDAS 50 mg is a white to off-white lyophilized cake or powder for reconstitution in a single-dose glass vial with a red aluminum band and a plastic cap. CANCIDAS 50-mg vial contains 50 mg of caspofungin equivalent to 55.5 mg of caspofungin acetate.CANCIDAS 70 mg is a white to off-white lyophilized cake or powder for reconstitution in a single-dose glass vial with a yellow/orange aluminum band and a plastic cap. CANCIDAS 70-mg vial contains 70 mg of caspofungin equivalent to 77.7 mg of caspofungin acetate. 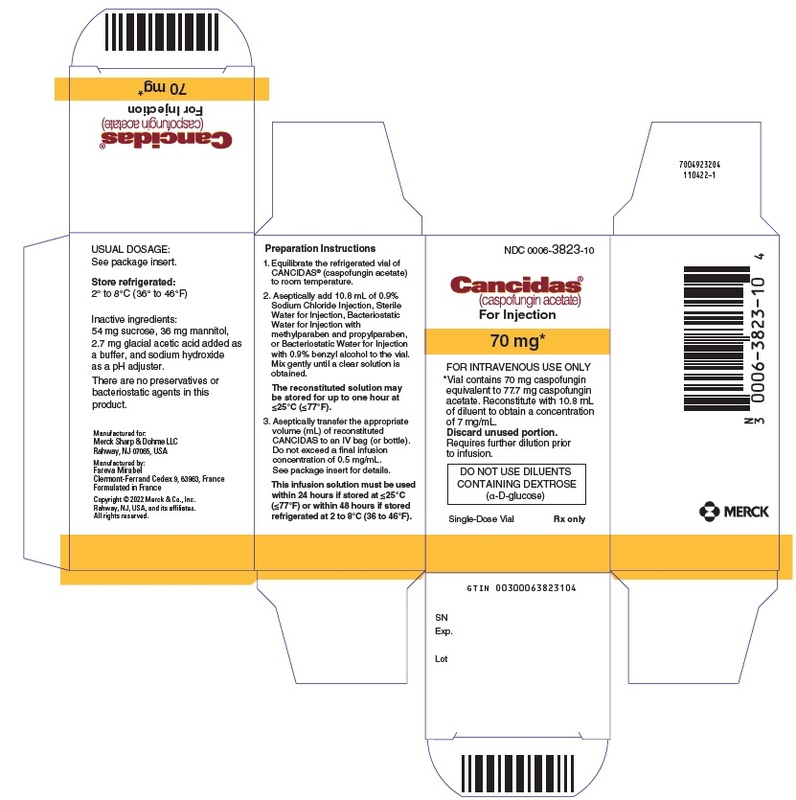 CANCIDAS is contraindicated in patients with known hypersensitivity (e.g., anaphylaxis) to any component of this product [see Adverse Reactions (6)]. Anaphylaxis and other hypersensitivity reactions have been reported during administration of CANCIDAS.Possible histamine-mediated adverse reactions, including rash, facial swelling, angioedema, pruritus, sensation of warmth or bronchospasm have been reported.Cases of Stevens-Johnson syndrome (SJS) and toxic epidermal necrolysis (TEN), some with a fatal outcome, have been reported with use of CANCIDAS [see Adverse Reactions (6.2)].Discontinue CANCIDAS at the first sign or symptom of a hypersensitivity reaction and administer appropriate treatment. Laboratory abnormalities in liver function tests have been seen in healthy volunteers and in adult and pediatric patients treated with CANCIDAS. In some adult and pediatric patients with serious underlying conditions who were receiving multiple concomitant medications with CANCIDAS, isolated cases of clinically significant hepatic dysfunction, hepatitis, and hepatic failure have been reported; a causal relationship to CANCIDAS has not been established. Monitor patients who develop abnormal liver function tests during CANCIDAS therapy for evidence of worsening hepatic function and evaluated for risk/benefit of continuing CANCIDAS therapy. Elevated liver enzymes have occurred in patients receiving CANCIDAS and cyclosporine concomitantly. Only use CANCIDAS and cyclosporine in those patients for whom the potential benefit outweighs the potential risk. Patients who develop abnormal liver enzymes during concomitant therapy should be monitored and the risk/benefit of continuing therapy should be evaluated. Because clinical trials are conducted under widely varying conditions, adverse reaction rates observed in clinical trials of CANCIDAS cannot be directly compared to rates in clinical trials of another drug and may not reflect the rates observed in practice. Pregnancy Category CThere are no adequate and well-controlled studies with the use of CANCIDAS in pregnant women. In animal studies, caspofungin caused embryofetal toxicity, including increased resorptions, increased peri-implantation loss, and incomplete ossification at multiple fetal sites. CANCIDAS should be used during pregnancy only if the potential benefit justifies the potential risk to the fetus.In offspring born to pregnant rats treated with caspofungin at doses comparable to the human dose based on body surface area comparisons, there was incomplete ossification of the skull and torso and increased incidences of cervical rib. There was also an increase in resorptions and peri-implantation losses. In pregnant rabbits treated with caspofungin at doses comparable to 2 times the human dose based on body surface area comparisons, there was an increased incidence of incomplete ossification of the talus/calcaneus in offspring and increases in fetal resorptions. Caspofungin crossed the placenta in rats and rabbits and was detectable in fetal plasma. The safety and effectiveness of CANCIDAS in pediatric patients 3 months to 17 years of age are supported by evidence from adequate and well-controlled studies in adults, pharmacokinetic data in pediatric patients, and additional data from prospective studies in pediatric patients 3 months to 17 years of age for the following indications [see Indications and Usage (1)]:Empirical therapy for presumed fungal infections in febrile, neutropenic patients.Treatment of candidemia and the following Candida infections: intra-abdominal abscesses, peritonitis, and pleural space infections.Treatment of esophageal candidiasis.Treatment of invasive aspergillosis in patients who are refractory to or intolerant of other therapies (e.g., amphotericin B, lipid formulations of amphotericin B, itraconazole).The efficacy and safety of CANCIDAS has not been adequately studied in prospective clinical trials involving neonates and infants under 3 months of age. Although limited pharmacokinetic data were collected in neonates and infants below 3 months of age, these data are insufficient to establish a safe and effective dose of caspofungin in the treatment of neonatal candidiasis. Invasive candidiasis in neonates has a higher rate of CNS and multi-organ involvement than in older patients; the ability of CANCIDAS to penetrate the blood-brain barrier and to treat patients with meningitis and endocarditis is unknown.CANCIDAS has not been studied in pediatric patients with endocarditis, osteomyelitis, and meningitis due to Candida. CANCIDAS has also not been studied as initial therapy for invasive aspergillosis in pediatric patients.In clinical trials, 171 pediatric patients (0 months to 17 years of age), including 18 patients who were less than 3 months of age, were given intravenous CANCIDAS. Pharmacokinetic studies enrolled a total of 66 pediatric patients, and an additional 105 pediatric patients received CANCIDAS in safety and efficacy studies [see Clinical Pharmacology (12.3) and Clinical Studies (14.5)]. The majority of the pediatric patients received CANCIDAS at a once-daily maintenance dose of 50 mg/m2 for a mean duration of 12 days (median 9, range 1-87 days). In all studies, safety was assessed by the investigator throughout study therapy and for 14 days following cessation of study therapy. The most common adverse reactions in pediatric patients treated with CANCIDAS were pyrexia (29%), blood potassium decreased (15%), diarrhea (14%), increased aspartate aminotransferase (12%), rash (12%), increased alanine aminotransferase (11%), hypotension (11%), and chills (11%) [see Adverse Reactions (6.2)].Postmarketing hepatobiliary adverse reactions have been reported in pediatric patients with serious underlying medical conditions [see Warnings and Precautions (5.3)]. Clinical studies of CANCIDAS did not include sufficient numbers of patients aged 65 and over to determine whether they respond differently from younger patients. Although the number of elderly patients was not large enough for a statistical analysis, no overall differences in safety or efficacy were observed between these and younger patients. Plasma concentrations of caspofungin in healthy older men and women (65 years of age and older) were increased slightly (approximately 28% in AUC) compared to young healthy men. A similar effect of age on pharmacokinetics was seen in patients with candidemia or other Candida infections (intra-abdominal abscesses, peritonitis, or pleural space infections). No dose adjustment is recommended for the elderly; however, greater sensitivity of some older individuals cannot be ruled out. Adult patients with mild hepatic impairment (Child-Pugh score 5 to 6) do not need a dosage adjustment. For adult patients with moderate hepatic impairment (Child-Pugh score 7 to 9), CANCIDAS 35 mg once daily is recommended based upon pharmacokinetic data [see Clinical Pharmacology (12.3)]. However, where recommended, a 70-mg loading dose should still be administered on Day 1 [see Dosage and Administration (2.4) and Clinical Pharmacology (12.3)]. There is no clinical experience in adult patients with severe hepatic impairment (Child-Pugh score greater than 9) and in pediatric patients 3 months to 17 years of age with any degree of hepatic impairment. In 6 healthy subjects who received a single 210-mg dose, no significant adverse reactions were reported. Multiple doses above 150 mg daily have not been studied. Caspofungin is not dialyzable.In clinical trials, one pediatric patient (16 years of age) unintentionally received a single dose of caspofungin of 113 mg (on Day 1), followed by 80 mg daily for an additional 7 days. No clinically significant adverse reactions were reported. No long-term studies in animals have been performed to evaluate the carcinogenic potential of caspofungin.Caspofungin did not show evidence of mutagenic or genotoxic potential when evaluated in the following in vitro assays: bacterial (Ames) and mammalian cell (V79 Chinese hamster lung fibroblasts) mutagenesis assays, the alkaline elution/rat hepatocyte DNA strand break test, and the chromosome aberration assay in Chinese hamster ovary cells. Caspofungin was not genotoxic when assessed in the mouse bone marrow chromosomal test at doses up to 12.5 mg/kg (equivalent to a human dose of 1 mg/kg based on body surface area comparisons), administered intravenously.Fertility and reproductive performance were not affected by the intravenous administration of caspofungin to rats at doses up to 5 mg/kg. At 5 mg/kg exposures were similar to those seen in patients treated with the 70-mg dose. In one 5-week study in monkeys at doses which produced exposures approximately 4 to 6 times those seen in adult patients treated with a 70-mg dose, scattered small foci of subcapsular necrosis were observed microscopically in the livers of some animals (2/8 monkeys at 5 mg/kg and 4/8 monkeys at 8 mg/kg); however, this histopathological finding was not seen in another study of 27 weeks duration at similar doses.No treatment-related findings were seen in a 5-week study in infant monkeys at doses which produced exposures approximately 3 times those achieved in pediatric patients receiving a maintenance dose of 50 mg/m2 daily. A double-blind study enrolled 1111 febrile, neutropenic (<500 cells/mm3) patients who were randomized to treatment with daily doses of CANCIDAS (50 mg/day following a 70-mg loading dose on Day 1) or AmBisome (3 mg/kg/day). Patients were stratified based on risk category (high-risk patients had undergone allogeneic stem cell transplantation or had relapsed acute leukemia) and on receipt of prior antifungal prophylaxis. Twenty-four percent of patients were high risk and 56% had received prior antifungal prophylaxis. Patients who remained febrile or clinically deteriorated following 5 days of therapy could receive 70 mg/day of CANCIDAS or 5 mg/kg/day of AmBisome. Treatment was continued to resolution of neutropenia (but not beyond 28 days unless a fungal infection was documented).An overall favorable response required meeting each of the following criteria: no documented breakthrough fungal infections up to 7 days after completion of treatment, survival for 7 days after completion of study therapy, no discontinuation of the study drug because of drug-related toxicity or lack of efficacy, resolution of fever during the period of neutropenia, and successful treatment of any documented baseline fungal infection.Based on the composite response rates, CANCIDAS was as effective as AmBisome in empirical therapy of persistent febrile neutropenia (see Table 9).Table 9: Favorable Response of Patients with Persistent Fever and NeutropeniaCANCIDASCANCIDAS: 70 mg on Day 1, then 50 mg once daily for the remainder of treatment (daily dose increased to 70 mg for 73 patients); AmBisome: 3 mg/kg/day (daily dose increased to 5 mg/kg for 74 patients).AmBisome% Difference(Confidence Interval)Overall Response: estimated % difference adjusted for strata and expressed as CANCIDAS – AmBisome (95.2% CI); Individual criteria presented above are not mutually exclusive. The percent difference calculated as CANCIDAS – AmBisome.Number of PatientsAnalysis population excluded subjects who did not have fever or neutropenia at study entry.556539Overall Favorable Response190 (33.9%)181 (33.7%)0.2 (-5.6, 6.0) No documented breakthrough fungal infection527 (94.8%)515 (95.5%)-0.8 Survival 7 days after end of treatment515 (92.6%)481 (89.2%)3.4 No discontinuation due to toxicity or lack of efficacy499 (89.7%)461 (85.5%)4.2 Resolution of fever during neutropenia229 (41.2%)223 (41.4%)-0.2The rate of successful treatment of documented baseline infections, a component of the primary endpoint, was not statistically different between treatment groups.The response rates did not differ between treatment groups based on either of the stratification variables: risk category or prior antifungal prophylaxis. In a randomized, double-blind study, patients with a proven diagnosis of invasive candidiasis received daily doses of CANCIDAS (50 mg/day following a 70-mg loading dose on Day 1) or amphotericin B deoxycholate (0.6 to 0.7 mg/kg/day for non-neutropenic patients and 0.7 to 1 mg/kg/day for neutropenic patients). Patients were stratified by both neutropenic status and APACHE II score. Patients with Candida endocarditis, meningitis, or osteomyelitis were excluded from this study.Patients who met the entry criteria and received one or more doses of IV study therapy were included in the modified intention-to-treat [MITT] analysis of response at the end of IV study therapy. A favorable response at this time point required both symptom/sign resolution/improvement and microbiological clearance of the Candida infection.Two hundred thirty-nine patients were enrolled. Patient disposition is shown in Table 10.Table 10: Disposition in Candidemia and Other Candida Infections (Intra-abdominal abscesses, peritonitis, and pleural space infections)CANCIDASPatients received CANCIDAS 70 mg on Day 1, then 50 mg once daily for the remainder of their treatment.Amphotericin BRandomized patients114125Patients completing studyStudy defined as study treatment period and 6-8 week follow-up period.63 (55.3%)69 (55.2%)DISCONTINUATIONS OF STUDYAll Study Discontinuations51 (44.7%)56 (44.8%) Study Discontinuations due to clinical adverse events39 (34.2%)43 (34.4%) Study Discontinuations due to laboratory adverse events0 (0%)1 (0.8%)DISCONTINUATIONS OF STUDY THERAPYAll Study Therapy Discontinuations48 (42.1%)58 (46.4%) Study Therapy Discontinuations due to clinical adverse events30 (26.3%)37 (29.6%) Study Therapy Discontinuations due to laboratory adverse events1 (0.9%)7 (5.6%) Study Therapy Discontinuations due to all drug-relatedDetermined by the investigator to be possibly, probably, or definitely drug-related. adverse events3 (2.6%)29 (23.2%)Of the 239 patients enrolled, 224 met the criteria for inclusion in the MITT population (109 treated with CANCIDAS and 115 treated with amphotericin B). Of these 224 patients, 186 patients had candidemia (92 treated with CANCIDAS and 94 treated with amphotericin B). The majority of the patients with candidemia were non-neutropenic (87%) and had an APACHE II score less than or equal to 20 (77%) in both arms. Most candidemia infections were caused by C. albicans (39%), followed by C. parapsilosis (20%), C. tropicalis (17%), C. glabrata (8%), and C. krusei (3%).At the end of IV study therapy, CANCIDAS was comparable to amphotericin B in the treatment of candidemia in the MITT population. For the other efficacy time points (Day 10 of IV study therapy, end of all antifungal therapy, 2-week post-therapy follow-up, and 6- to 8-week post-therapy follow-up), CANCIDAS was as effective as amphotericin B.Outcome, relapse and mortality data are shown in Table 11.Table 11: Outcomes, Relapse, & Mortality in Candidemia and Other Candida Infections (Intra-abdominal abscesses, peritonitis, and pleural space infections)CANCIDASPatients received CANCIDAS 70 mg on Day 1, then 50 mg once daily for the remainder of their treatment.Amphotericin B% DifferenceCalculated as CANCIDAS – amphotericin B after adjusting for strata(Confidence Interval)95% CI for candidemia, 95.6% for all patientsNumber of MITTModified intention-to-treat patients109115FAVORABLE OUTCOMES (MITT) AT THE END OF IV STUDY THERAPYAll MITT patients81/109 (74.3%)78/115 (67.8%)7.5 (-5.4, 20.3)Candidemia67/92 (72.8%)63/94 (67.0%)7.0 (-7.0, 21.1) Neutropenic6/14 (43%)5/10 (50%) Non-neutropenic61/78 (78%)58/84 (69%)Endophthalmitis0/12/3Multiple Sites4/54/4 Blood / Pleural1/11/1 Blood / Peritoneal1/11/1 Blood / Urine-1/1 Peritoneal / Pleural1/2- Abdominal / Peritoneal-1/1 Subphrenic / Peritoneal1/1-DISSEMINATED INFECTIONS, RELAPSES AND MORTALITYDisseminated Infections in neutropenic patients4/14 (28.6%)3/10 (30.0%)All relapsesIncludes all patients who either developed a culture-confirmed recurrence of Candida infection or required antifungal therapy for the treatment of a proven or suspected Candida infection in the follow-up period.7/81 (8.6%)8/78 (10.3%) Culture-confirmed relapse5/81 (6%)2/78 (3%)Overall studyStudy defined as study treatment period and 6-8 week follow-up period. mortality in MITT36/109 (33.0%)35/115 (30.4%) Mortality during study therapy18/109 (17%)13/115 (11%) Mortality attributed to Candida4/109 (4%)7/115 (6%)In this study, the efficacy of CANCIDAS in patients with intra-abdominal abscesses, peritonitis and pleural space Candida infections was evaluated in 19 non-neutropenic patients. Two of these patients had concurrent candidemia. Candida was part of a polymicrobial infection that required adjunctive surgical drainage in 11 of these 19 patients. A favorable response was seen in 9 of 9 patients with peritonitis, 3 of 4 with abscesses (liver, parasplenic, and urinary bladder abscesses), 2 of 2 with pleural space infections, 1 of 2 with mixed peritoneal and pleural infection, 1 of 1 with mixed abdominal abscess and peritonitis, and 0 of 1 with Candida pneumonia.Overall, across all sites of infection included in the study, the efficacy of CANCIDAS was comparable to that of amphotericin B for the primary endpoint.In this study, the efficacy data for CANCIDAS in neutropenic patients with candidemia were limited. In a separate compassionate use study, 4 patients with hepatosplenic candidiasis received prolonged therapy with CANCIDAS following other long-term antifungal therapy; three of these patients had a favorable response.In a second randomized, double-blind study, 197 patients with proven invasive candidiasis received CANCIDAS 50 mg/day (following a 70-mg loading dose on Day 1) or CANCIDAS 150 mg/day. The diagnostic criteria, evaluation time points, and efficacy endpoints were similar to those employed in the prior study. Patients with Candida endocarditis, meningitis, or osteomyelitis were excluded. Although this study was designed to compare the safety of the two doses, it was not large enough to detect differences in rare or unexpected adverse events [see Adverse Reactions (6.1)]. The efficacy of CANCIDAS at the 150 mg daily dose was not significantly better than the efficacy of the 50-mg daily dose of CANCIDAS. The efficacy of doses higher than 50 mg daily in the other adult patients for whom CANCIDAS is indicated has not been evaluated. The safety and efficacy of CANCIDAS in the treatment of esophageal candidiasis was evaluated in one large, controlled, noninferiority, clinical trial and two smaller dose-response studies.In all 3 studies, patients were required to have symptoms and microbiological documentation of esophageal candidiasis; most patients had advanced AIDS (with CD4 counts <50/mm3).Of the 166 patients in the large study who had culture-confirmed esophageal candidiasis at baseline, 120 had Candida albicans and 2 had Candida tropicalis as the sole baseline pathogen whereas 44 had mixed baseline cultures containing C. albicans and one or more additional Candida species.In the large, randomized, double-blind study comparing CANCIDAS 50 mg/day versus intravenous fluconazole 200 mg/day for the treatment of esophageal candidiasis, patients were treated for an average of 9 days (range 7-21 days). Favorable overall response at 5 to 7 days following discontinuation of study therapy required both complete resolution of symptoms and significant endoscopic improvement. The definition of endoscopic response was based on severity of disease at baseline using a 4-grade scale and required at least a two-grade reduction from baseline endoscopic score or reduction to grade 0 for patients with a baseline score of 2 or less.The proportion of patients with a favorable overall response was comparable for CANCIDAS and fluconazole as shown in Table 12.Table 12: Favorable Response Rates for Patients with Esophageal CandidiasisAnalysis excluded patients without documented esophageal candidiasis or patients not receiving at least 1 day of study therapy.CANCIDASFluconazole% DifferenceCalculated as CANCIDAS – fluconazole(95% CI)Day 5-7 post-treatment66/81 (81.5%)80/94 (85.1%)-3.6 (-14.7, 7.5)The proportion of patients with a favorable symptom response was also comparable (90.1% and 89.4% for CANCIDAS and fluconazole, respectively). In addition, the proportion of patients with a favorable endoscopic response was comparable (85.2% and 86.2% for CANCIDAS and fluconazole, respectively).As shown in Table 13, the esophageal candidiasis relapse rates at the Day 14 post-treatment visit were similar for the two groups. At the Day 28 post-treatment visit, the group treated with CANCIDAS had a numerically higher incidence of relapse; however, the difference was not statistically significant.Table 13: Relapse Rates at 14 and 28 Days Post-Therapy in Patients with Esophageal Candidiasis at BaselineCANCIDASFluconazole% DifferenceCalculated as CANCIDAS – fluconazole(95% CI)Day 14 post-treatment7/66 (10.6%)6/76 (7.9%)2.7 (-6.9, 12.3)Day 28 post-treatment18/64 (28.1%)12/72 (16.7%)11.5 (-2.5, 25.4)In this trial, which was designed to establish noninferiority of CANCIDAS to fluconazole for the treatment of esophageal candidiasis, 122 (70%) patients also had oropharyngeal candidiasis. A favorable response was defined as complete resolution of all symptoms of oropharyngeal disease and all visible oropharyngeal lesions. The proportion of patients with a favorable oropharyngeal response at the 5- to 7-day post-treatment visit was numerically lower for CANCIDAS; however, the difference was not statistically significant. Oropharyngeal candidiasis relapse rates at Day 14 and Day 28 post-treatment visits were statistically significantly higher for CANCIDAS than for fluconazole. The results are shown in Table 14.Table 14: Oropharyngeal Candidiasis Response Rates at 5 to 7 Days Post-Therapy and Relapse Rates at 14 and 28 Days Post-Therapy in Patients with Oropharyngeal and Esophageal Candidiasis at BaselineCANCIDASFluconazole% DifferenceCalculated as CANCIDAS – fluconazole(95% CI)Response Rate Day 5-7 post-treatment40/56 (71.4%)55/66 (83.3%)-11.9 (-26.8, 3.0)Relapse Rate Day 14 post-treatment17/40 (42.5%)7/53 (13.2%)29.3 (11.5, 47.1)Relapse Rate Day 28 post-treatment23/39 (59.0%)18/51 (35.3%)23.7 (3.4, 43.9)The results from the two smaller dose-ranging studies corroborate the efficacy of CANCIDAS for esophageal candidiasis that was demonstrated in the larger study.CANCIDAS was associated with favorable outcomes in 7 of 10 esophageal C. albicans infections refractory to at least 200 mg of fluconazole given for 7 days, although the in vitro susceptibility of the infecting isolates to fluconazole was not known. Sixty-nine patients between the ages of 18 and 80 with invasive aspergillosis were enrolled in an open-label, noncomparative study to evaluate the safety, tolerability, and efficacy of CANCIDAS. Enrolled patients had previously been refractory to or intolerant of other antifungal therapy(ies). Refractory patients were classified as those who had disease progression or failed to improve despite therapy for at least 7 days with amphotericin B, lipid formulations of amphotericin B, itraconazole, or an investigational azole with reported activity against Aspergillus. Intolerance to previous therapy was defined as a doubling of creatinine (or creatinine ≥2.5 mg/dL while on therapy), other acute reactions, or infusion-related toxicity. To be included in the study, patients with pulmonary disease must have had definite (positive tissue histopathology or positive culture from tissue obtained by an invasive procedure) or probable (positive radiographic or computed tomography evidence with supporting culture from bronchoalveolar lavage or sputum, galactomannan enzyme-linked immunosorbent assay, and/or polymerase chain reaction) invasive aspergillosis. Patients with extrapulmonary disease had to have definite invasive aspergillosis. Patients were administered a single 70-mg loading dose of CANCIDAS and subsequently dosed with 50 mg daily. The mean duration of therapy was 33.7 days, with a range of 1 to 162 days.An independent expert panel evaluated patient data, including diagnosis of invasive aspergillosis, response and tolerability to previous antifungal therapy, treatment course on CANCIDAS, and clinical outcome.A favorable response was defined as either complete resolution (complete response) or clinically meaningful improvement (partial response) of all signs and symptoms and attributable radiographic findings. Stable, nonprogressive disease was considered to be an unfavorable response.Among the 69 patients enrolled in the study, 63 met entry diagnostic criteria and had outcome data; and of these, 52 patients received treatment for greater than 7 days. Fifty-three (84%) were refractory to previous antifungal therapy and 10 (16%) were intolerant. Forty-five patients had pulmonary disease and 18 had extrapulmonary disease. Underlying conditions were hematologic malignancy (N=24), allogeneic bone marrow transplant or stem cell transplant (N=18), organ transplant (N=8), solid tumor (N=3), or other conditions (N=10). All patients in the study received concomitant therapies for their other underlying conditions. Eighteen patients received tacrolimus and CANCIDAS concomitantly, of whom 8 also received mycophenolate mofetil.Overall, the expert panel determined that 41% (26/63) of patients receiving at least one dose of CANCIDAS had a favorable response. For those patients who received greater than 7 days of therapy with CANCIDAS, 50% (26/52) had a favorable response. The favorable response rates for patients who were either refractory to or intolerant of previous therapies were 36% (19/53) and 70% (7/10), respectively. The response rates among patients with pulmonary disease and extrapulmonary disease were 47% (21/45) and 28% (5/18), respectively. Among patients with extrapulmonary disease, 2 of 8 patients who also had definite, probable, or possible CNS involvement had a favorable response. Two of these 8 patients had progression of disease and manifested CNS involvement while on therapy.CANCIDAS is effective for the treatment of invasive aspergillosis in patients who are refractory to or intolerant of itraconazole, amphotericin B, and/or lipid formulations of amphotericin B. However, the efficacy of CANCIDAS for initial treatment of invasive aspergillosis has not been evaluated in comparator-controlled clinical studies. The safety and efficacy of CANCIDAS were evaluated in pediatric patients 3 months to 17 years of age in two prospective, multicenter clinical trials.The first study, which enrolled 82 patients between 2 to 17 years of age, was a randomized, double-blind study comparing CANCIDAS (50 mg/m2 IV once daily following a 70-mg/m2 loading dose on Day 1 [not to exceed 70 mg daily]) to AmBisome (3 mg/kg IV daily) in a 2:1 treatment fashion (56 on caspofungin, 26 on AmBisome) as empirical therapy in pediatric patients with persistent fever and neutropenia. The study design and criteria for efficacy assessment were similar to the study in adult patients [see Clinical Studies (14.1)]. Patients were stratified based on risk category (high-risk patients had undergone allogeneic stem cell transplantation or had relapsed acute leukemia). Twenty-seven percent of patients in both treatment groups were high risk. Favorable overall response rates of pediatric patients with persistent fever and neutropenia are presented in Table 15.Table 15: Favorable Overall Response Rates of Pediatric Patients with Persistent Fever and NeutropeniaCANCIDASAmBisomeOne patient excluded from analysis due to no fever at study entry.Number of Patients5625Overall Favorable Response26/56 (46.4%)8/25 (32.0%) High risk9/15 (60.0%)0/7 (0.0%) Low risk17/41 (41.5%)8/18 (44.4%)The second study was a prospective, open-label, non-comparative study estimating the safety and efficacy of caspofungin in pediatric patients (ages 3 months to 17 years) with candidemia and other Candida infections, esophageal candidiasis, and invasive aspergillosis (as salvage therapy). The study employed diagnostic criteria which were based on established EORTC/MSG criteria of proven or probable infection; these criteria were similar to those criteria employed in the adult studies for these various indications. Similarly, the efficacy time points and endpoints used in this study were similar to those employed in the corresponding adult studies [see Clinical Studies (14.2, 14.3, and 14.4)]. All patients received CANCIDAS at 50 mg/m2 IV once daily following a 70-mg/m2 loading dose on Day 1 (not to exceed 70 mg daily). Among the 49 enrolled patients who received CANCIDAS, 48 were included in the efficacy analysis (one patient excluded due to not having a baseline Aspergillus or Candida infection). Of these 48 patients, 37 had candidemia or other Candida infections, 10 had invasive aspergillosis, and 1 patient had esophageal candidiasis. Most candidemia and other Candida infections were caused by C. albicans (35%), followed by C. parapsilosis (22%), C. tropicalis (14%), and C. glabrata (11%). The favorable response rate, by indication, at the end of caspofungin therapy was as follows: 30/37 (81%) in candidemia or other Candida infections, 5/10 (50%) in invasive aspergillosis, and 1/1 in esophageal candidiasis. Storage and HandlingThe lyophilized vials should be stored refrigerated at 2° to 8°C (36° to 46°F). Inform patients that anaphylactic reactions have been reported during administration of CANCIDAS. CANCIDAS can cause hypersensitivity reactions, including rash, facial swelling, angioedema, pruritus, sensation of warmth, or bronchospasm. Inform patients to report these signs or symptoms to their healthcare providers. Inform patients that there have been isolated reports of serious hepatic effects from CANCIDAS therapy.